AEV is a unique company, in that it has both the expertise and experience in house to undertake a wide range of automotive engineering tasks. Additional services offered include GVM Upgrades, Lift Kit Installation, Long Range Fuel Tank Install and Certification, Chassis Extensions, All Automotive Engineering certification and much more. The Managing Director, Michael McMillan MSc (MVT), BEng (Mech), MIEAust, CPENG and in Queensland a Registered Professional Engineer (RPEQ), AEV has the capability to undertake, both design and testing, utilising ANSYS software for Finite Element Analysis of components, as part of a submission for Approvals to State and Federal statutory bodies. AEV is a Licensed Production Facility registered with the Department of Infrastructure and Regional Services. As well as our famous 6WD Conversion and VDJ79 Coil Conversions, here are some other services that we offer. We are the only authorised installer of Wholesale Automatic Transmissions in North Queensland. All work is done in-house by our experienced team. This can be as simple as a 10% GVM upgrade allowed under QLD Transport Regulation to larger upgrades including stronger rear diff housing and upgraded suspension. Service includes any engineering required and the QLD Modification Plate. Note: This option will require upgraded suspension. If you don't already have this, we can arrange and install new suspension to meet the requirements. This option can be completed on a variety of vehicles for a number of reasons. 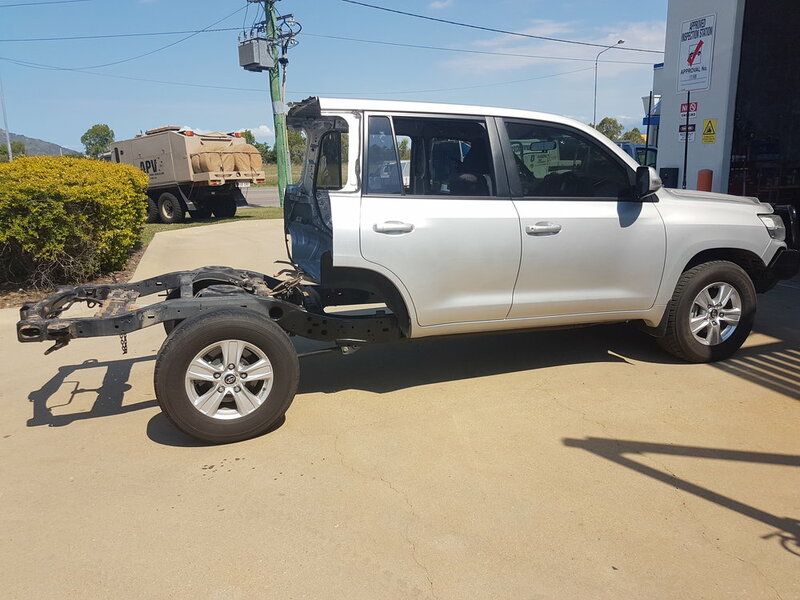 From a VDJ79 Dual Cab getting a 300mm extension for a larger tray more centrally located over the axle, to a VDJ200 wagon getting a Dual Cab conversion and a 600mm extension for large tray and GVM upgrade. These extensions are all engineered in house by our Mechanical Engineer and fully certified for Australian roads. From standard height replacement to a 2 inch upgrade, all the way up to 4 inch (if viable) we can fulfil your suspension wishes. We use brands such as EFS, Dobinson, Ironman, Icon, and can get many more. Call in and see what we can do for you. Whether it is long range fuel tanks, seating number changes, automatic gearbox conversion, and many others, we can engineer and certify the modifications you need to make your vehicle great.